As I sipped my coffee, careful not to let any drip on my business casual attire, I contemplated just how long I had been thinking about this day. Honestly it was a little anti-climactic. Finally it was time to go. With notes and thesis in my bag, I walked across campus on what turned out to be a beautiful morning. The butterflies in my stomach had been going for 24 hours, but I fought them down as I entered Dulles Hall. Eventually I found myself in a classroom, sitting around a table with three professors I have come to know very well and who had all read my work. Before I knew it, an hour had gone by. We had discussed my research, made a few jokes, dissected my argument, and I was done. I was left to wonder- had I just defended or simply had a conversation with my professors? I felt a little bit like I was in an extended version of office hours. I reflected on the advice my advisor had used earlier that week to calm me down about the entire process. The thesis defense should be exciting- when else would there be so many smart people sitting around a table talking about something I wrote? Listening to my opinion? My committee members stood to shake my hand; I received a hug and a book from my advisor. And then I was free, my master’s degree essentially complete. Looking back, I think the thesis experience, while stressful, forced me to do everything you’re supposed to do in college, at least academically. I got to know professors, found professional experience, and explored my own individual interests within my field. 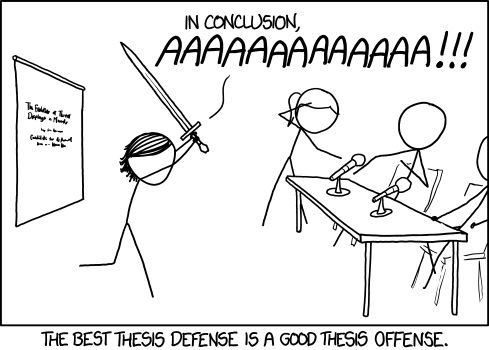 I think everyone should write a final thesis if they can. But that isn’t to say I’m not glad mine is over.